1. Start this Kuber Mantra Sadhana from Dhanteras or Diwali. 2. Start this Sadhana at dusk facing north. Sit on a Red Velvet Aasan in Padmaasan/Kamal Aasan. 3. Bring a yellow or red Chowki in front of you and spread a yellow cloth on it. Keep 3 Yantras in front of you on mounts of rice - Shri Yantra, Shiv Yantra and Kuber Yantra. Also keep a Ganesh idol or Yantra whatever you prefer. 4. Then establish a copper Kalash full of water on a mount of rice. 5. Light 2 pure Ghee Diya and 2 Sesame Oil Diyas. Use Earthen Diyas only. 6. Then, worship your Guru, then Ganesha, then Lakshmi . i.e the Shri Yantra, then worship Shiv Yantra and finally Kuber Yantra. 5. First Do Panchopchar Puja of Ganesha. I am sharing the procedure of Panchopchar Puja ahead. After doing Ganesha Puja, recite his mantra "ॐ गं गणपतये नमः " 1 rosary using Rudraksh Mala. 6. Then do Panchopchar Puja of Shri Yantra, Shiv and finally Kuber. Dhoop – offer a Dhoop of Guggul or whatever you prefer. Naivedya – offer Naivedya of bananas to each of them. Gandh – offer a paste of Kesar or Chandan to the 4 corners of the Yantra. 7. After doing Panchopchar Puja, recite 1 rosary of Lakshmi Gayatri Mantra and Shiv Gayatri Mantra. Then, recite Amogh Shiv Kavach. 8. Then take a Sankalp by mentioning the respective Vedic year, Vedic month, Paksh, etc and that you are doing this Purashcharan for fulfilling your so and so wishes. 9. Recite this Mantra 50 rosaries daily for 20 days using Rudraksh Rosary. The Mantra Sadhana is specially for Dhanteras and Diwali. If this Sadhana is started on some other day, chances of success will be lesser. One will getting astonishing results if this Sadhana is done in a Shivalay. 1) Make a Tilak of Chandan or Kesar and only then do the Japa. 2. Make sure the oil and Pure Ghee does not end during the Japa. 3. Even though this Mantra does not require Deeksha, During the Sadhana days certain conduct and discipline needs to be followed other wise your Sadhana will go in vain. I have specified various rules like Bhumi Shayyiyaa, Brahmacharya, daily Daan, complete surrender to god, etc. You can refer to those articles for more information. 4. Everyday Sakha must go to Shivalay in the morning and offer Be Petra, Chandan, rice, milk, etc to Shilling. Pleasing Lord Shiv is equally important as pleasing Lord Kuber in this Sadhana. 5. Do not forget to recite Amogh Shiv Kavach because Lord Kuber is said to be king of Yakshas and it is said that this Mantra is also used for attracting Yakshas. 6. Mantra can be chanted by men and women but keep in mind that the chanting requirement of 1 lac. If you cannot do so much Japa then don't begin the Sadhana. If you break the Sadhana, your wealth conditions will deteriorate. This is a personally experienced fact. For Sadhana rules, please refer to my posts on Sadhanas shared in the past. Also, one must perform Sandhya daily early in the morning and then at dusk. Sandhya is nothing but doing Achaman; Pranayam (Rechak, Kumbhak) 10-15 times and chanting your God's Gayatri Mantra 1-5 rosaries. In some parts of India, 30th November is also considered as Dev Dipawali. Hence, the Mantra Sadhana can also be started be today. 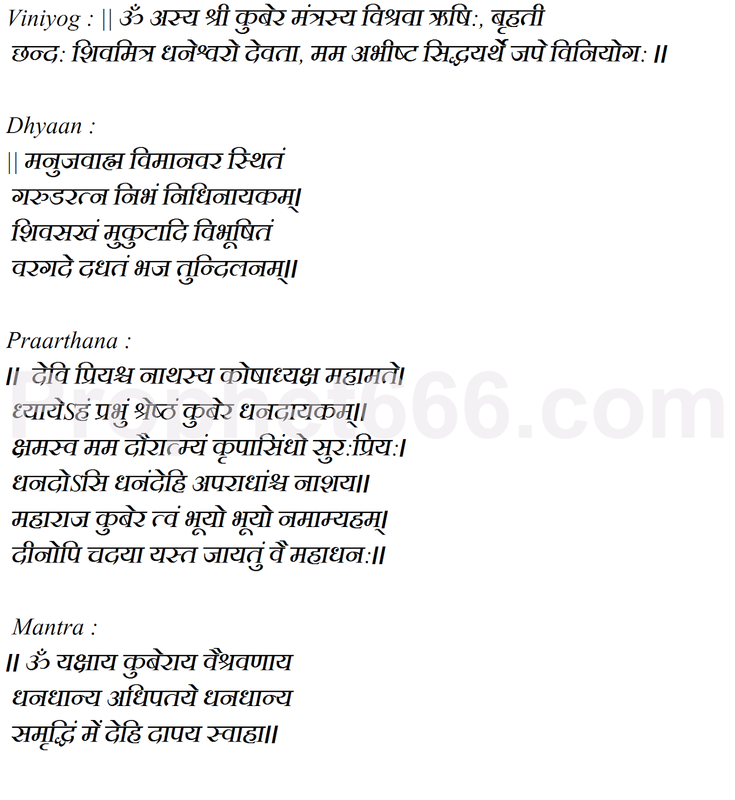 the last line of the mantra is given me dehi dapaya swaha. i have read in another book as - me dehi dadaapaya swaha. which is correct? Most books have wrong version of this mantra, some even have multiple errors . Neel ji, Yellow Dhoti me Sadhana/Prayog karna kaisa rahega, please bataeye. Neel Ji, will appreciate mantras in English please. Many thanks. om asya shrikuber mantrasya Vishrawaa rishih,brihati chhandah,shivmitra dhaneshwaro devtaa mam abhishta-sidhyarthe jape viniyogah. deenopi chadayaa yasta jaayatum vai mahaadhanah. dhan-dhaanya samriddhim me dehi daapaya swaahaa. Great work in helping all those who requested an English version of the Mantra. which one is correct Mnatra of Kuber posted above, is this one right "dhan-dhaanya adhipataye " or this one "Dhanadhanya dhipataye "
The one posted above, its pronounced dhaanya adhipataye and this 2nd version is pronouced Dhanadhanya dhipataye. then do I have to take the all yantras there ? or sadhana can be done withour yantras in shivalay ? 2. If there are other visitor devotees in shivalay , is it ok to do sadhana there in fornt of others ? 3. In last part of mantra the word 'Me' in 'me dehi dapay swaha' has a bindu-dot on it , So is this an error or not . If no then how it has to be pronounced ? 4. if possible can you post image of an authentic kuber yantra ? There are some variations in its types- vedic type , and the tantric types . 2. You must try to do it in a shivalay which is at a secluded place. 3. The dot comes in hindi and not in sanskrit. 4. You can the use the popularly used kuber yantra. Ashok Sir, like you have given Lakshmi mata mantra for wealth shreem. Can you please provide god shiva's mantra for getting wealth. Can you please provide if there is any book available for this wherein all of the above details/information for Kuber Sadhna is written in Marathi along with all mantras for Shri mantra, Shiv mantra and kuber mantra. The Hindi transcription looks blur to me and can't read or pronounce it well. Please help. There is long time for next dhanteras now and also I have some questions that needs some clarifications on the above article.. Can you please let me know if there is any mantra that I can do daily Japa for Kuber mantra and tell me if daily 108 mantra Japa is fine or not enough..
विस्तार से पोस्ट में दी गई है . धनधान्यसमृद्धिम मे नेत्रत्रयाय वौषट्, देहि दापय स्वाहा अस्त्राय फट् . इस मन्त्र का एक लाख जप करना चाहिए । तिलों से उसका दशांश होम करना चाहिए . @neel g @ashok g mae crystal rosery use karna chahta hu iss sadhna kar sakta hu? शांतिकर्म ,ज्ञान प्राप्ति व् माँ सरस्वती के मन्त्रों ,भैरवी साधना के लिए उपयुक्त है .